A feng shui necklace by May Pang. Synchronicity is always at play in my life. I had just finished reading the last interview with John Lennon & Yoko Ono and posted about it on my Feng Shui By Fishgirl blog. Then I was searching online for feng shui jewelry and discovered this line designed by May Pang. In case you are not old enough to remember, May Pang was John Lennon’s companion during his infamous “Lost Weekend” (a weekend that lasted 18 months in LA). I contacted Ms. Pang to find out if this line was currently available so I could feature it here on my blog. She graciously emailed me back to say yes. 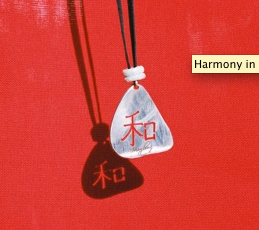 Each necklace represents a different auspicious feng shui intention such as Harmony, pictured here. The designs are simple, clean, and uncluttered—just like a space should be when feng shui principles are applied to it. The Lost Weekend…read the Wiki version; in a nutshell Yoko and John split for 18 months and he had a love affair with their assistant May Pang (with Yoko’s encouragement!) throughout the 18 months they were apart. Albums from this period were ‘Mind Games’, ‘Walls & Bridges’ (I believe May Pang won a producing award for this one), and ‘Rock ‘n’ Roll’. It was supposedly a period of drunken wildness for Lennon and he talked about it in the last interview (current book out by David Scheff). May Pang’s recent book of photos proves it wasn’t all bad.